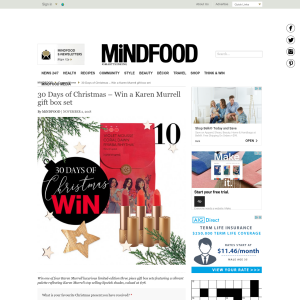 Win one of four Karen Murrell luxurious limited-edition three piece gift box sets featuring a vibrant palette reflecting Karen Murrel’s top selling lipstick shades, valued at $78. What is your favourite Christmas present you have received? Entry is open to New Zealand residents only. To enter, individuals must, during the competition period, visit www.mindfood.com follow the prompts on the competition entry page, input the requested details including the answer in 25 words or less to the following question “What is your favourite Christmas present you have received?” and submit the fully completed entry form. Competition commences on 02/11/2018 AEST. Entries close 10pm on 24/11/2018 AEST. The judging will take place at McHugh Media Australia Pty Ltd, 102/4-14 Buckingham Street Surry Hills NSW 2010 on 25/11/2018 by 12pm AEST. Winners will be notified by email. The Promoter’s decision is final and no correspondence will be entered into. The Promoter has four Karen Murrell gift box sets to give away, valued at $78. Total prize value is $312. Prizes are not transferable or exchangeable and cannot be taken as cash.